Use “S” treads patterns only. These tread patterns are designed and manufactured to cope with the specific stresses and strains imposed on the steering axles of the truck: dynamic load, axle geometry, high mileage, etc. We do not recommend mounting retreaded tyres on the front axle of motor vehicles. When fitting tyres on a DRIVE axle we must: Use tyres with “D” or “S” tread patterns exclusively. 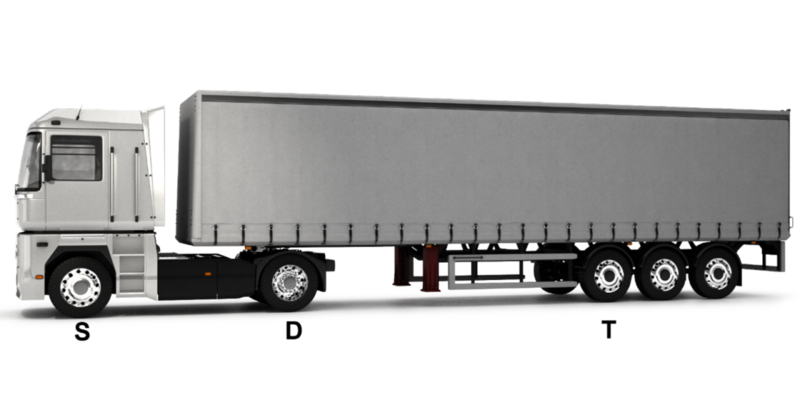 “D” tread patterns are designed to cope with the specific stresses of the drive axles: engine torque and brake torque, twin fitment, the highest axle load of the whole truck combination. Tyres with a “S” tread pattern can be fitted on drive axles, but the compromise likely in mileage performance needs to be considered carefully. “D” treads patterns offer optimized performances in the areas of traction and tyre longevity when compared to the “S” tread patterns. Use tyres with “T” or “S” tread patterns exclusively. These tread patterns are designed to cope with the specific stresses and strains of trailer axles: static and dynamic loads, scrubbing, high mileage on the Centre axles, etc. Tyres with “T” tread patterns bear load indices and speed ratings suited to trailers or semi-trailers. When fitting tyres with “S” tread patterns, check that the load and speed index comply with the needs of the axle and that there is no “T” tread pattern which would better suit the specific stresses and strains of trailer axles. Tyres with “T” tread must never be used on front steer or drive axles. The FRT (Free Rolling Tyre) marking is stipulated in Regulation 54: Marking 3.1.15. The presence of the "FRT" marking denotes tyres specifically designed for trailer axles (tyres for towed axles). This regulation applies to all new tyres used within Europe, which means that FRT-marked tyres are only authorised to be mounted on trailer axles and cannot be installed on other types of axles. We cannot be held liable for the consequences of any damage incurred while driving if its instructions are disregarded. A “FRT” branded tyres can be mounted on the last non-drive rear axle of a motor vehicle. Please refer to each specific country legislation for tyre fitment and note that it can require mounting the same type of tyres on the same axle. And the same speed rating. However, for optimised tyre performance we recommend to mount tyres with the same tread pattern on the same axle. If this is not possible, we advise to mount twinned tyres of the same type. Respect the positions, fitting direction, direction of rotation and any relevant instructions when mentioned on the tyre sidewalls. 2. It is NOT ADVISED to mount retreaded tyres from different retreaders on the same axle, regardless of the brand of the casing. 3. It is AUTHORISED to mount retreaded tyres from the same retreaders, regardless of the brand of the carcass. 1. The brand of the retreaded & new tyres is the same. 2. The brand of the casings is the same. 4. tread type (road, all-terrain, 3PMSF & M+S marking). Retreaded tyres are designed and manufactured to be used on drive axles and trailer axles. We do not recommend the mounting of retreaded tyres on the front steer axle of the truck. Please refer to each specific country legislation for retreaded tyres fitment on the same axle. Any damage to the rim with a tyre professional. Never put tyre units back on the road that show any damage, such as misshaped or exposed bead wire, detached rubber or plies, damage caused by grease or corrosive substances, mottling or abrasion of the interior rubber after any driving with under-inflated tyres. Tyres showing any of the above must be demounted, scrapped and processed as waste. Make sure the valve cap is in good condition at every vehicle inspection. In case of doubt, replace it. Tyre rotation is an operation consisting of removing the tyre from one position on the vehicle and refitting it in another position. Turning on the rim is an operation consisting of removing the tyre from the rim and refitting it the other way round. Clean, dry, temperate and well-ventilated premises, sheltered from direct sunlight and bad weather. Well away from any chemical substance, solvent or hydrocarbon likely to alter the nature of the rubber. Well away from any object which might penetrate the tyre (metal spike, wood, etc.). Well away from any source of heat, flame, incandescent bodies, equipment which might give off sparks or electrical discharges and any source of ozone (transformers, electric motors, welding sets, etc.). When storing in stacks, make sure that the tyres are not deformed. If they are to be stored for a long time, rotate the tyres (reverse the order of the tyres in the stacks), so as to be able to extract the oldest tyres first. Avoid compressing the tyres under other objects. We advise that the difference between the depths of the main grooves on two tyres fitted on the same axle must not exceed 5mm at the same phase of life (regrooved /non-regrooved). The depth of the main grooves at four points evenly distributed on the tyre's circumference must not be below one millimeter on more than one of those points. If the legal wear or technical limit has been reached, the tyres must be uninstalled and replaced according to the country legislation. Over the course of a tyre's life, it is subjected to a number of constraints and can be damaged in a variety of ways. It is dangerous to ignore a damaged tyre. Our truck tyres can be repaired under certain conditions. However, not all kinds of damage can be repaired. Repairing a tyre is a job for trained and qualified professionals. The tyre repairer always has sole responsibility for the accuracy and quality of the work done on the tyre. Repair must always be preceded by removal of the tyre and a thorough inspection both internal and external, by the professional. If any damage is found which cannot be repaired, such as over flexing of the reinforcing structure owing to deflated or severely under inflated running, the tyre must not be repaired. Pressure checks should be made on all the tyres on the vehicle (including the spare wheel). If the inflation pressure is too low, the result is an abnormal rise in running temperature which may lead to damage to the internal components. This damage is irreversible and may cause the destruction of the tyre and rapid deflation. The consequences of running with insufficient pressure in the tyres are not necessarily immediate and may even become apparent after the pressure has been corrected. Insufficient inflation pressure also greatly increases the risk of aquaplaning. Over-inflation can cause rapid and irregular wear and increased sensitivity to impact (tread damage, casing failure). a reduction in casing resistance, which limits the possibility of retreading. Check tyre pressures when the tyres are cold. The pressure increases in use: never reduce the pressure of a tyre while it is hot. Never re-inflate a tyre which has been running underinflated without a thorough inspection both inside and out. Under inflation could result in the tyres running at abnormally high temperatures, leading to thermal degradation of the tyres' components. To ensure optimum safety, reliability and business efficiency it&rsquo;s important to fit the correct tyre specification. This can be done by observing certain selection criteria. The manufacturer must authorize the dimension and it must at least match the axle's maximum load capacity. The maximum permitted axle load given by the vehicle manufacturer in relation to the regulations in force. Fitting this axle with tyres which can support a greater load does not mean that a load homologated by the vehicle manufacturer can be exceeded. For each tyre size there are one or more corresponding approved wheel rim sizes: consult the ETRTO "Standard Manual" and/or the vehicle manufacturer's recommendations. Fitting a tyre on a non-approved wheel rim can lead to damage to the wheel and/or the tyre, a footprint which is less than optimum and abnormal working of the casing which can be prejudicial to safety, handling, grip and tyre service life. To select the right tyre, we have to take into account the type of use and the benefits of each range. Our tyres offer different benefits depending on the operators&rsquo; specific needs. There are rules which HAVE TO BE followed when selecting the tread patterns of your tyres.